One of the highlights of these special features is a half-hour interview with Malkovich conducted by the great John Hodgman. Not only do both men offer fantastic insight into what the film is about and why it still resonates but the great actor drops some incredible history about the film, including the fact that he approached Charlie Kaufman about directing it himself before Jonze was involved but there was a catch — they had to change who it was “about.” (I suppose John Malkovich’s “Being John Malkovich” would have sounded silly). One can only marvel at the alternate universe version of this film that exists in which Malkovich directed “Being Gary Sinise” or something similar. It’s an awesome interview. But it’s only one of several great special features. Filmmaker Lance Bangs filmed a ton of behind-the-scenes footage and it’s been assembled into a great documentary called “All Noncombatants Please Clear the Set.” Fans of the film should pick up this release JUST for that special feature and the Malkovich interview. The rest of the special features on the second disc of the DVD release are quirky and fun, directly in the spirit of the film, and the first disc includes scene-specific commentary. 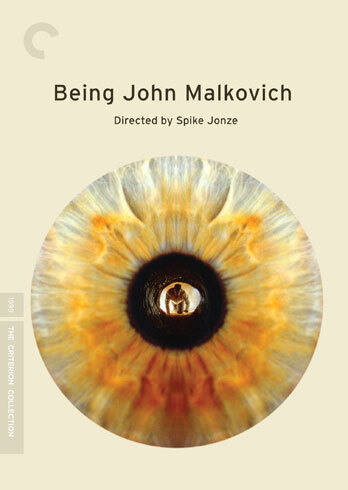 As for the movie itself, “Being John Malkovich” is much better than I remembered and I was always something of a fan. I was startled at how great the performances have held up — it has to be considered top five for John Cusack, Catherine Keener, and Cameron Diaz — and how confidently directed. Spike Jonze has directed three films in 13 years — this one, “Adaptation,” and “Where the Wild Things Are.” One hopes that Criterion gets the rights to the other two. Have you ever wanted to be someone else? Or, more specifically, have you ever wanted to crawl through a portal hidden in an anonymous office building and thereby enter the cerebral cortex of John Malkovich for fifteen minutes before being spat out on the side of the New Jersey Turnpike? Then director Spike Jonze and writer Charlie Kaufman have the movie for you. Melancholy marionettes, office drudgery, a frizzyhaired Cameron Diaz- but that’s not all! Surrealism, possession, John Cusack, a domesticated primate, Freud, Catherine Keener, non sequiturs, and absolutely no romance! But wait: get your Being John Malkovich now and we’ll throw in emasculation, slapstick, Abelard and Heloise, and extra Malkovich, Malkovich, Malkovich. “Being John Malkovich” stars John Cusack, Catherine Keener, Orson Bean, Mary Kay Place, Cameron Diaz, and John Malkovich. It was written by Charlie Kaufman and directed by Spike Jonze. It was released on Criterion Blu-ray and DVD on May 15, 2012.